Really, Aries? 4 batches? What's going on? --- These are the usual reactions I get when I tell people that I am going to change things for The Next Erzullie Icon 2016 and I want to do it 4 times this year. For those of you who have not read it, the #TNEI2016 details are out and if you really did read it, it states there --- BATCH 1 OF 4. Yes, Erzulliestas, there will be 4 batches. But how many are you getting exactly? As I have always said every year --- as many as we can or none at all. Experience though, it's always 2. But, we will never know. With 4 batches up ahead, hopefully, we find more. I like surrounding myself with Erzulliestas anyway. So, why 4 batches? Well, last year we didn't get to do it. And Erzullie, along with other inquiries, has been bombarded about it. There was even one model that got mad at us because she said she prepared for it, only to see no announcement whatsoever. Well, what can I do? I can't lie to people. We had to stop and we also did announce in all of our social accounts about the matter. With that, I decided to make it into 4 batches to actually make up for lost time. This way, I get a lot of options and plus size models will have more time and chances to get in. I can't remember anymore how many applications we had last year, but definitely did not go down to 1K. And that was just 2-3 weeks of time. I wonder how many we would amass in total this year. I just want to take my time and go through it all. Are you The Next Erzullie Icon (#TNEI2016)? We asked this question just a few days ago and so far, around 648 Erzulliestas have responded. Thank you so much for this overwhelming response. Now remember for this batch, the cut-off for the forms is on January 23, 2016. PLUS SIZE DESIGNER: WHY DO WE ALWAYS LOOK FOR TROUBLE? It's a classic thing to happen inside of me. Recently, things have been going very well with Erzullie. I had a collaboration with Q-York and after that a heartfelt interview with Entrep TV. After doing all the aftermaths --- post press and clean up --- I have decided to go to BGC to at least have a change of scenery. I have been in Eastwood too long. I need some Taguig air. I went there and looked through my usual section. Out of my curiousity, I saw this book about Chinese horoscopes. These things have not always been kind to me. Last 2014, it didn't exactly paint my year right. So for 2015, I have decided to forgo that and just get lost my own way. 2015 was cruel and hilarious to me. So whether or not I have read anything bad, I felt like crap anyway. So, as that year 2015 was about to end. I wanted to own my 2016. I don't know what happened to me but for the first time in the long time, I felt great. It felt like I can actually have a great year. So, with all my positivity, I opened that Chinese horoscope again ---just to confirm this great feeling. I looked at mine and saw a disturbing news about a specific month due to a specific start that fell on that gauge. I felt --- "World! Why me?" It was at that point that I thought to myself, if I didn't go and open that book, I think I would have stayed on may positive path and would go on just fine. 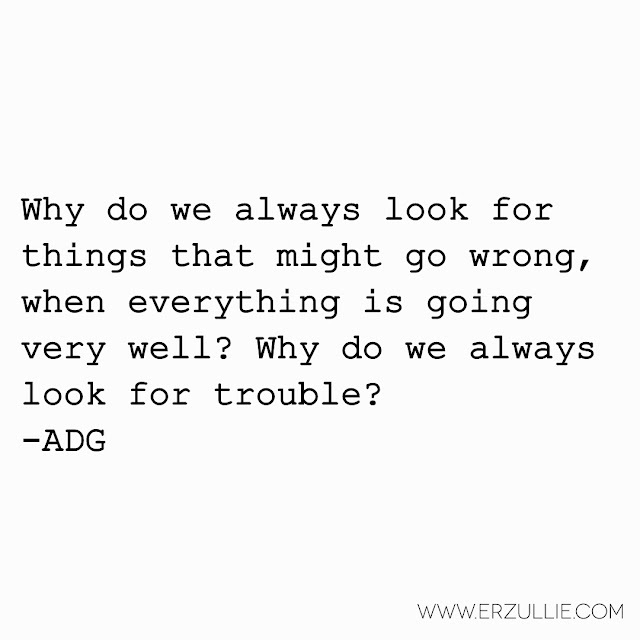 But this disturbed me,, why do we always look for trouble or something that might go wrong, when everything around us is totally fine? I was thinking, maybe we want to be ready. Maybe we also just want to validate what we are feeling. Or maybe we just really can't believe it that for the first time in a very long time, everything is fine. We look for the things that are about to ruin it because that is the only thing we can count on. Now isn't that a nightmare?